AS Roma have confirmed the location of their proposed new stadium in a special press conference at their training camp in Orlando. Ever since Thomas DiBenedetto took over the club in 2011, he had made it clear that building a new stadium was one of their priorities, and in March this year the club announced that they had hired real-estate consultants Cushman & Wakefield to go site hunting. Many different sites have been suggested in the nine months since, but it soon became clear that there was a strong front-runner in the Tor di Valle site in the south-west of the city. It was most of all its relatively central location in comparison to the other options that made it the favourite. It therefore came as no surprise that it was this site that was officially announced as the site for the new stadium. The Tor di Valle site is located on the south-western outskirts of the city at about 10 kilometres from Rome’s historic centre just within the ring road. 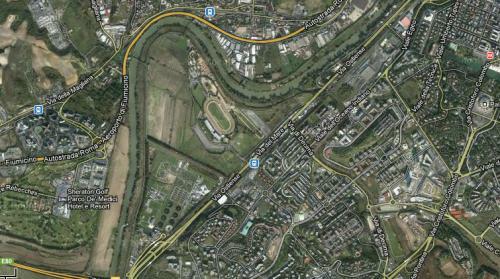 The site lies on the banks of the river Tiber and is currently occupied by a racetrack that will get demolished. It is served by trains on the local Roma-Lido line, though station Tor di Valle (and the line) will need further development. Roma furthermore announced that property developer Luca Parnasi has been appointed as project manager of the building works. Parnasi had earlier bought the Tor di Valle site for commercial development. The club also confirmed that the new stadium will have a capacity of 55,000 to 60,000 seats, and added that this is enough to host future Champions League finals. The last time UEFA selected a stadium with such modest size was back in 2004 though, when the VELTINS Arena had the honour. The new stadium project will include other commercial activities such as restaurants, retail, and offices. Architect Dan Meis has been hired to design the stadium, which is expected to cost between €165 and €210 million. Roma stated that they expect to need the next year to overcome all bureaucratic hurdles, though could get there quicker if Italian’s special stadium law gets approved. The club hopes to move into the new stadium before the start of the 2016-17 season.